Congratulations to homeschool groups on tax exempt status! 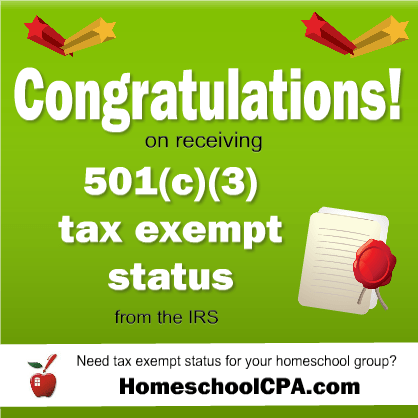 Congratulations to several homeschool organizations recently granted 501(c)(3) tax exempt status by the IRS! Both Lifeshine and Grace had their tax exempt status automatically revoked for failure to file the IRS Form 990 for 3 consecutive years. Fortunately, I was able to help them get their tax exempt status reinstated and neither group owed any back taxes. Yeah! Do you know about the IRS required annual reporting for ALL nonprofit organizations (that means your homeschool group, even if you never had to file any reports with the IRS before)? Do you have questions about the tax exempt status of your organization? Contact me and I will help your homeschool organization get tax exempt status (or get it back if it was revoked). It’s better than paying taxes! I am directing a local Classical Conversations group, and many churches in our area will not consider housing us because we are not a nonprofit. Since I am basically an independent contractor licensed by CC corporate to run a community in my area, am I potentially eligible to have my community declared a nonprofit? I recently discussed nonprofit status for CC Communities with Classical Conversations COO, Keith Denton. He explained to me that “CC Directors (who are licensees of CC) may form an entity through which to run their homeschooling operations. “CC does not require a director to run his/her homeschooling program through an entity, nor does it require that such director choose a specific type of entity (non-profit versus for profit) for its homeschooling community. I have helped several classical homeschool program apply for 501c3 tax exempt status, but not a community under a licensed director. I can help you weigh the pros and cons of for profit or nonprofit status for your CC Community. Contact me to schedule a phone consultation. The webinar will be recorded for later viewing. 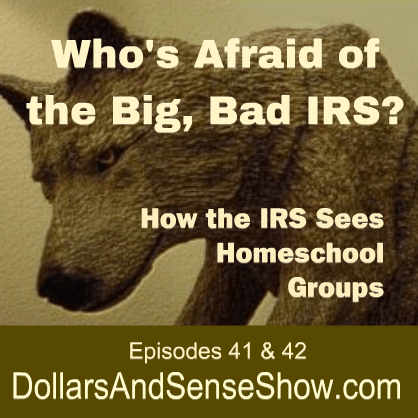 In this episode of the Dollars and Sense Show podcast, host Carol Topp continues her topic “Who’s Afraid of the IRS?” and discusses how the IRS sees homeschool co-ops and 501(c)(3) tax exempt status. Listen to the first part of this presentation where Carol discussed homeschool support groups and IRS 501(c)(7) tax exempt status as a Social Club. Get a copy of the handout. Carol also mentioned the article “Do You Know About IRS Required Filings for Homeschool Organizations?” Get it here. Carol’s book, The IRS and Your Homeschool Organization, is available here. An original copy of their organizing document. Fortunately Crossroads had Articles of Association complete with the IRS required language all ready to go! Actual revenues and expenses for 3 years. I helped Crossroads write a reply to the IRS and in only 5 days, their 501(c)(3) status was granted! We don’t think that the IRS was targeting Crossroads Co-op or homeschool groups; we think Crossroads was just randomly selected by the IRS to provide details. The important lesson learned is that nonprofit organizations need to have their financial information and organizing documents ready to send into the IRS when asked. Applying for 501(c)(3) tax exempt status is more than just filling out the Form 1023-EZ online. It involves properly structuring your nonprofit. Crossroads had done that, so they were able to answer all the IRS questions and get their tax exempt determination letter in a timely manner. If you need help applying for tax exempt status for your nonprofit organization, contact me. 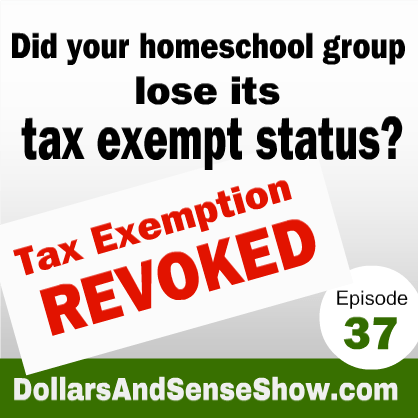 Your homeschool group may have lost its tax exempt status and not even know it! I explain this problem in an episode of the Dollars and Sense Show podcast. In 2006, the IRS made filing an annual report (Form 990/990-EZ, 990-N) mandatory for nonprofit organizations. Nonprofits that failed to file the Form 990 for three consecutive years, had their tax exempt status automatically revoked. In the podcast, I discuss how to know if your group’s tax exempt status was revoked and how to get it back. 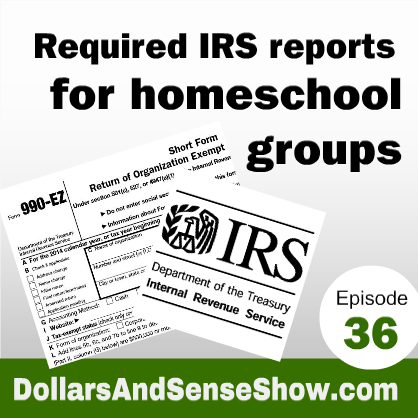 Episode #36 Required IRS Reports for Homeschool Groups explains the Form 990. 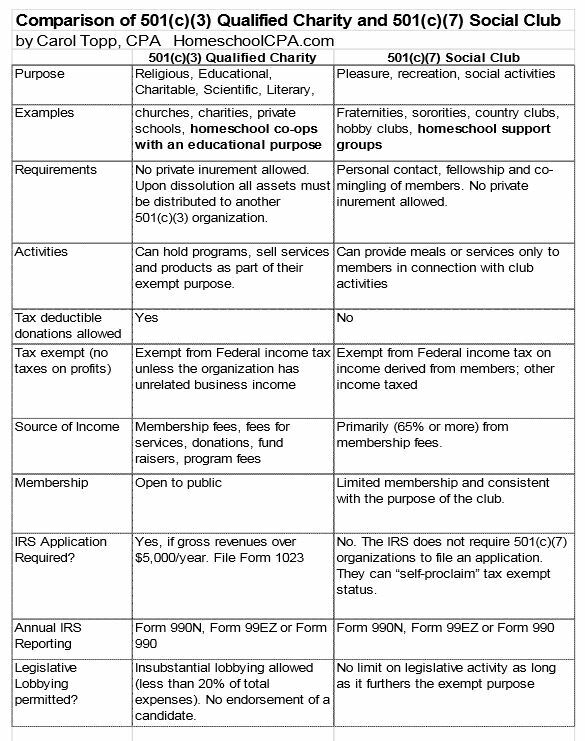 My book The IRS and Your Homeschool Organization is a helpful resource for homeschool organizations considering the benefits of tax exempt status. Available here. If you would benefit from a personal phone consultation, I’d would be happy to help your homeschool organizations. Contact Carol. Homeschool groups awarded 501c3 status in less than 10 days! Congratulations to the following homeschool organizations who received their 501(c)(3) tax exempt status from the IRS recently and in less than 10 days. If your homeschool organization needs help with applying for tax exempt status, please consider letting me, Carol Topp, CPA, guide you. Here’s a description of my services. What is the difference between a homeschool support group and a homeschool co-op? After much reading, I have come up with a question… What is the difference between a homeschool group and a homeschool co-op? I took over the leadership of our local, small, informal, unincorporated homeschool group last year. We’re a group of families that meet for unstructured socialization/play time twice a month. We offer classes for all age groups, workshops for moms & dads, date nights/coffee nights for moms & dads, monthly field trips, monthly activity days, and even some on-going activity days. After reading Carol Topp’s book Homeschool Co-ops, and talking with the HSLDA support group liaison in regards to support groups, I am thinking that the group I am in charge of is a style of co-op. Is this right, wrong, both or neither? I make a differentiation between co-op and support groups because their tax exempt status is different in the eyes of the IRS. Homeschool co-ops have an educational focus and qualify for 501(c)(3) status as educational organizations. Homeschool support groups have social interaction and support as their focus and the IRS would classify them as 501(c)(7) Social Clubs. Here’s an article explaining the differences. It includes a chart comparing 501(c)(3) (co-ops) and 501(c)(7) (support groups). Homeschool Groups As Social Clubs. From hearing about their activities and money, I can usually help discern if their group is a 501(c)(3) (educational co-op) or 501(c)(7) social club (support group). It sounds like Jacquelyn’s group is a support group. Support groups fit the IRS 501c7 social club status and can “self declare” their tax exempt status without officially applying. (educational organizations with more than $5,000 annual gross revenues must apply for 501(c)(3) status). For Jacquelyn’s group and hundreds like them, the tipping point comes when the group gets an EIN from the IRS to open a checking account. That’s then the IRS knows about your group and it will need to start filing the annual 990N (it’s online and only 8 question. it takes about 5 minutes once a year). Important disclaimer: I stated that a co-op is a 501(c)(3) and a support group is a 501(c)(7), but that is my interpretation of the IRS tax code. You will not find homeschool groups mentioned in the IRS rules and regulations. (PTL!) I have discussed homeschool group classifications with IRS employees, read a ton and have attended workshops put on by the IRS. I’m a CPA and homeschooled for 14 years. I still belong to my support group, even though I retired from homeschooling 4 years ago. But I want to make it clear that I am using my CPA knowledge and homeschool experience to help homeschool organizations understand and comply with IRS regulations. P.S. Jacqueline found Homeschool Co-ops: How To Start Them, Run Them and Not Burn Out helpful. Congratulations to Christian Homeschool Organization Interact Connect Encourage (CHOICE) in South Carolina on recently receiving 501(c)(3) tax exempt status with the IRS. I was happy to help this homeschool organization use the new IRS short Form 1023-EZ. They received their tax exempt letter in 3 weeks. Thank you so much for all of your help. 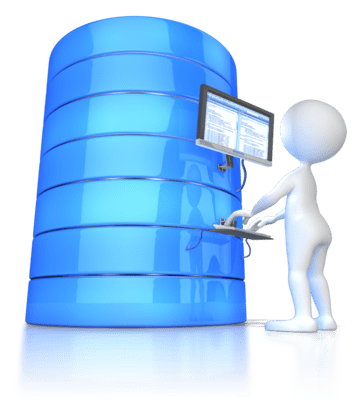 We have you in our budget now, so that we can contact you with questions whenever we need answers. I am a little nervous about knowing what forms need to be sent where and when. 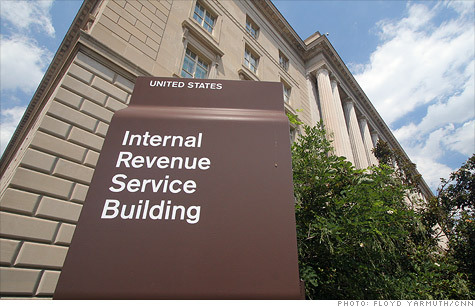 If you’re uncertain about what your organization needs to file with the IRS and your state, please contact me. I can help you sort it all out. Tax exempt status is not automatic! Do you know what forms your homeschool organization should be filing with the IRS? My (recently updated) book The IRS and Your Homeschool Organization could help you understand when and how to become tax exempt.